To book this caravan we ask for a £50 non refundable deposit to secure your dates. We do also ask for an additional £50 bond with all bookings which is refunded within 5 working days of your departure if our caravan is left in a reasonable condition and our T&C's have been followed. 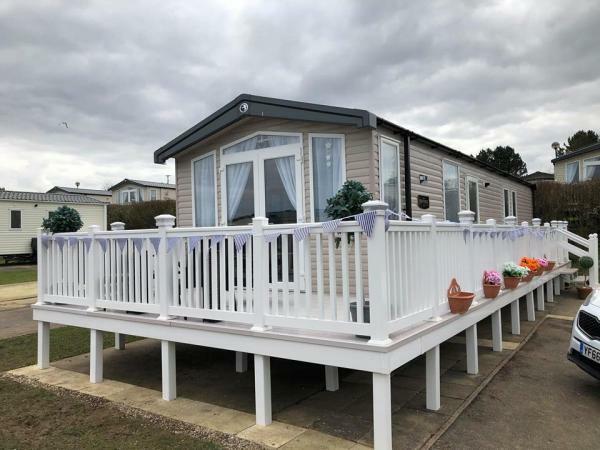 Our lovely Swift Provence is located on the Cedar Woods area at Reighton Sands and has its own private parking next to the caravan. The caravan is located in a peaceful part of the park yet only minutes from the onsite facilities. This caravan is double glazed and has central heating throughout. The caravan has a large, open-plan living area and kitchen which is fully equipped with all your essentials. The lounge has freestanding sofas, a 32’ TV and an electric fire. The kitchen is complete with all cooking essentials such as pots, pans, toaster and microwave etc. The caravan has 3 Bedrooms (1x double and 2 twins), it sleeps 6 guests in total. We provide all duvets and pillows for our guests but they do need their own bed linen. The caravan has a shower, wash basin and toilet in the family bathroom, with a 2nd toilet and wash basin en-suite to the master bedroom. Check In for the caravan is from 1:00pm on your arrival date. On the caravan we have a key safe box which is where we keep the keys. The code to access this box is sent on your arrival date at the allocated check in time. Check Out is 10am on your official departure date.